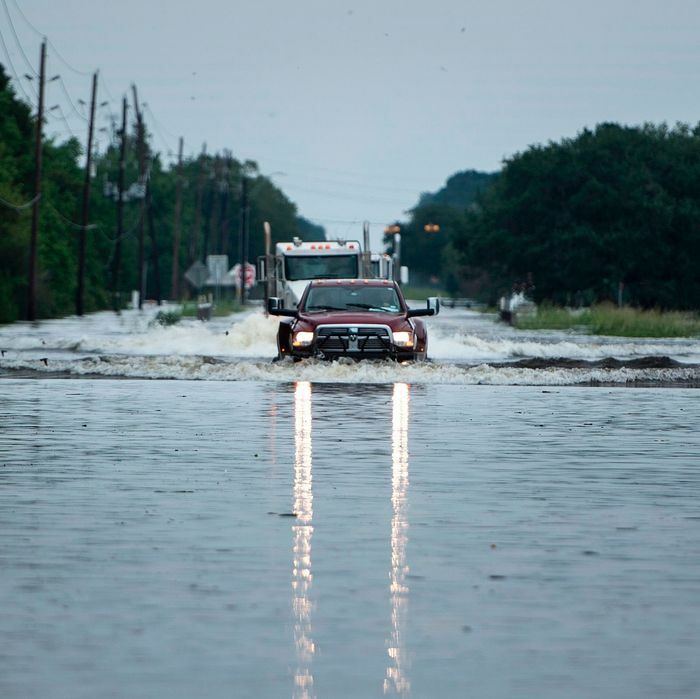 Trucks make their way through floodwaters on a road leading to the Arkema, Inc., chemical plant. The Arkema chemical plant in Crosby, Texas, is going to explode any day now, the CEO of the organic-chemical company said Wednesday. On Tuesday, all of the plant’s workers were sent home, residents within 1.5 miles of the plant were evacuated, and a nearby stretch of highway was shut down after the plant was inundated with water from Hurricane Harvey and the subsequent flooding. CEO Richard Rowe told reporters that the plant has taken on six feet of water and there’s “no way to prevent” an explosion. He expects it to happen some time in the next six days, as the chemicals produced at the plant, which are typically refrigerated, rise in temperature. Rowe said the plant initially used generators to power the refrigeration system, but when those failed after the flood, the chemicals were moved to diesel-powered refrigerators. Now, the water has compromised those, too. The plant, one of five operated by Arkema in Texas, produces peroxides that are used to make plastics and rubbers. Those volatile peroxides, along with the number of homes near the plant, resulted in it landing on a list of Houston-area industrial sites with the highest potential for catastrophe in the event of a natural disaster.